As soon as my kids were old enough to start having snacks in the car, it meant that they were much happier in the car. I don't advocate eating out of boredom, but being strapped in a car seat is a lot more fun when you can munch on some Cheerios or Goldfish. I had no problem passing back the snacks and they had no problem spilling them. However, they were happy so I was happy. The one person in our family that wasn't happy was my sweet, clean car loving hubby. He loves a good clean car and over the years he has gotten a little more relaxed with his super clean car ways, but he still can be a stickler and I'll say it has rubbed off on my a little bit. The other thing we have a love/hate relationship with are car seats. 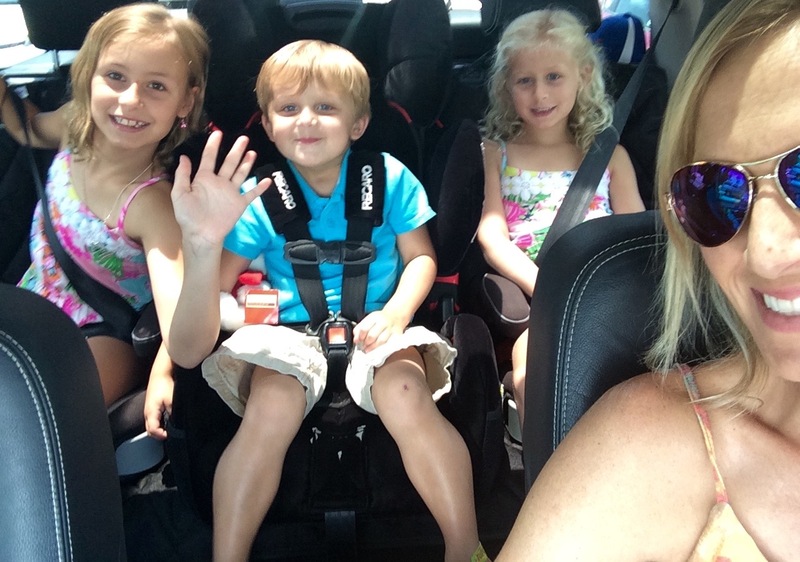 Of course we want our children to be safe when they ride in the car, but the damage they can do to leather seats is no joke. We've been using individual car seat mats under each of their car seats and that helps with protecting the leather from dents and scratches, but that doesn't help when it comes to the snacks that might get spilled and slip in between the car seats. There's nothing like trying to remove caked on granola bar crumbs from your nice leather seats. When the amazing people at VersaLiving Seat Covers asked if we would like to give their rear car seat cover a try, we jumped at the chance. Even my skeptical hubby was pretty excited when he first saw it and installed it in my car right away. It's made from a heavy duty waterproof material and has a non-slip backing that keeps it into place. There are velcro openings to allow access to seat belts and the latch system. Because I have three car seats in my back seat, we had to do little musical chairs with the car seats to make it work. You can't get access to the seat belt in the middle, but there are openings for the latch system, so we moved Boo-Boo's car seat to the middle and put the booster seats on either side, which is working great. And, as you can see, everyone is happy as can be with the new line-up. We take our dog with us a lot in the car on trips or just around town, but he sheds like crazy and the result is a ton of dog hair all over the place. It's a big mess! But, I could totally see how using the VersaLiving seat cover to protect cars from pet hair would be life changing. No more scratches from their nails or dog hair stuck to the seats! The other thing I really like about this seat cover is that it comes all the way down on the sides and in the front of the seat and really protects the whole thing...not just the part where the carseat touches the seats. If kids have dirty shoes or kick the seats a lot, you don't have to worry because the entire seat is covered and protected. 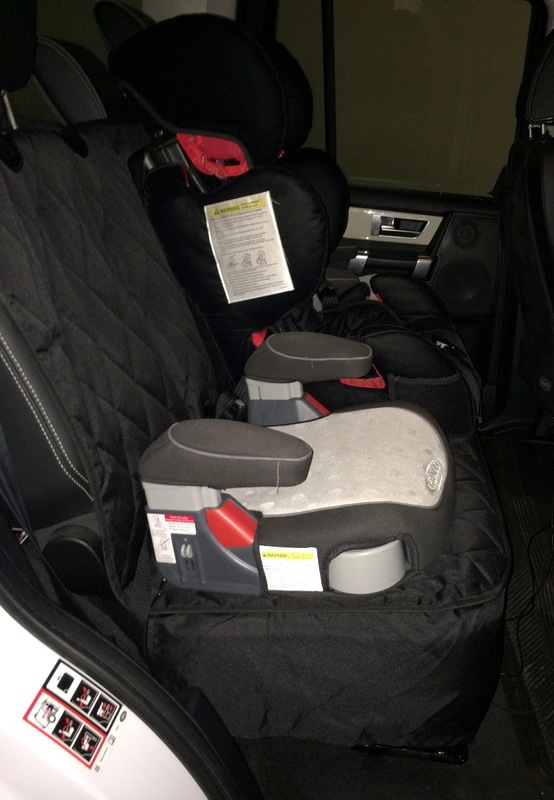 I'm sure lots of you have the same issues I do with trying to protect your car from carseat, kid, or pet damage. You can purchase your own VersaLiving seat cover from Amazon. 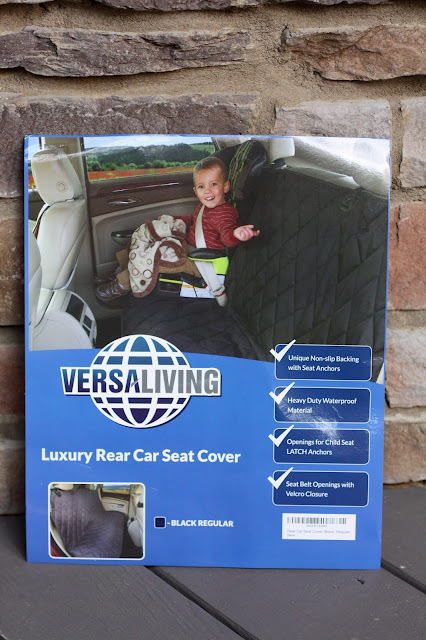 But, the awesome people at VersaLiving have agreed to give one of their seat covers to one of our lucky readers! To enter the giveaway simply leave a comment below telling us why you could use one of these seat covers. We'll use a random number generator to pick the winner next Thursday so you have one week to comment. The winner will be announced Friday, June 26. Good luck! With a 4 year old that must have snacks in the car with every outing, a 7 month old spit up machine and a 7 year old dog that gets car sick. I could definitely use this lol! Thanks for sharing! With 2 black/tan doxies, I would love this car seat cover! I have a three year old and 2 dogs, that I transport daily. Between the drips and the hair, my back seat can become messy. This is amazing! And with two littles we have tons of messes!! Love iit! My car is always a disaster! This would be amazing. I can't clean my car during the summer because it's too hot outside in Florida! This would be a lifesaver! With a wooly malamute, this sure would be great to have! With two dogs this would be great! I'm not sure who would appreciate this more...my dog Cookie or m new car who has to compete with Cookie's hair. Since my backseat looks so similar to yours I could definitely use this! I was just saying yesterday that we must get a cover for the entire seat! Thanks for sharing! Between a new baby that we are expecting, all my nieces and nephews and a husky that sheds a lot this defiantly would come in handy. thanks for your sharing and posts. Share Your Summer - What's in My Pool Bag?